PSA for Writers: Even if you usually skip the Q&As on this blog, you should read this one, particularly what Trent has to say about the Bechard Factor below. Tell us the origin story and history of Stealing Air. Stealing Air is a story I have been working with on and off for about twenty years. It began as a very short and simple story that was my response to a sixth grade English class assignment. Our challenge was to write any story we wished about "Freaky Frankie," this cartoonish Frankenstein's monster we were shown. I knew all the other kids would come up with scary or Halloween stories, so I wanted to write something different. I wrote a piece called "Flyboys," in which Frankie was just a tough guy who picked on three boys whose passion was building a tiny skateboard-mounted airplane that two of the boys hoped to fly around on. "Flyboys" was a big hit, and I was asked to read it at a sixth grade Halloween party. I never let go of the core idea for that story, and sometime in my early twenties, I expanded "Flyboys" into a novel-length manuscript. In the novel version, I developed the skateboard-based airplane, added a neat friendship dynamic, and gave the protagonist a romantic interest. I had high hopes that this would be my first published novel. However, when I was sent to Afghanistan with the Iowa Army National Guard in support of Operation Enduring Freedom, all of my plans changed. I became fascinated by the country I had been sent to help reconstruct, and I made a vow in my heart to one particularly inspiring Afghan girl, promising I would do all I could to tell her story. Thus, instead of Flyboys, the adventure story of three sixth-grade boys from Iowa who become friends while building a plane in a secret workshop, my first published novel was Words in the Dust, the story of a young Afghan girl who struggles to find peace and lasting meaning in post-Taliban, Afghanistan. Writing Words in the Dust was a very serious, emotionally demanding process, and so when I set out to write my second novel, I needed something more light-hearted and adventurous. Flyboys was just the right story. However, reading that old novel-length story after all I had learned at the Vermont College of Fine Arts and after what I’d learned working with you, I realized Flyboys would need to be completely rewritten. Most of the plot and characters remained the same, but the resulting novel Stealing Air is incredibly different, a lot better than its prototype stories. How was writing your second novel both different from and similar to writing your first? The process of getting a novel published can be very difficult and usually requires a lot of work. In my long journey to publication, I felt ready for the extensive revisions I would have to do to prepare my first novel Words in the Dust for submission to publishers. There are many magazine articles and blog posts about this. What the articles and blogs did not prepare me for was the awesome amount of work in revision that takes place after signing the book contract. The course of revisions and copy edits was exhausting but exhilarating. When it was over and Words in the Dust was a real book on the shelf, I was pleased with the result, knowing I had done my very best with that novel. In life we often have the tendency to look at the past with a filter that can remove from our immediate memory a lot of the difficulties and hardships we faced in a given time. This filter enables some people to long for the “good old days” of high school which can be remembered with fondness, as long as they don’t think about all the old social pressures and tedious homework assignments. I think to a certain extent, I was looking back on my first novel experience with a similar filter. I dove into writing and revising Stealing Air with the idea that I was a more experienced writer, thinking that the process should be smoother and easier. What I learned is that, for me at least, every new novel presents its own unique complications. It’s like starting over. And how wonderful is that? 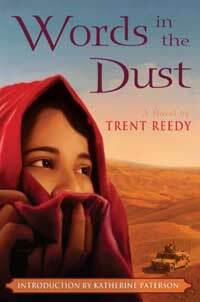 I loved the challenge of writing and revising Words in the Dust. After the initial sense of surprise and frustration in dealing with Stealing Air’s issues, I eventually embraced my chance to relive the “good old days” of preparing another novel for publication. Who were your best friends when you were in sixth grade? What was the worst trouble you ever got up to together? I’ve been blessed in my life with many great friends, so I don’t want to say that the peak of my friendships was in the sixth grade, but it was a special kind of friendship in fifth and sixth grade. Maybe it was because hanging out with the guys in those days was so new. For the first time, we didn’t need our parents looking over our shoulders so much. Everything felt very new and full of potential. We’d head out of town on the old abandoned railroad tracks, and find our own world away from adult influence, at the Runaway Bridge, this limestone railroad bridge that crossed a little creek. There we would mess around, trying with little success to avoid falling into the water and mud. Unfortunately, this bridge has since been destroyed, but I keep a piece of its limestone on my bookshelf as a reminder of those times. We never found ourselves in too much trouble, but I remember sometime around sixth grade, I was staying overnight at my friend Tim’s house. We always thought it was fun to sneak out after his parents had gone to sleep. I don’t know why this seemed like such an adventure. In a little farm town with just over 1,300 people, there wasn’t much to do late at night. I know that for some reason we were terrified of being caught by Dysart’s lone police officer. On one night we had sneaked out with illegal fireworks, a few “black cats,” and planned to set them off at different places around town. It was a breezy night, so we had trouble getting the fuse to light. Our bright idea was to simply shorten the fuse. As a result, the thing went off before we had our chance to make a getaway. It was a tiny little pop, really, but we were sure everyone in town had heard it, and that the cop was on his way. We sprinted away from the scene of our crime, running through the dark and crossing a street by the elementary school. From behind me, I heard the sound of a traffic sign rattling as if Tim had slapped it while running past. I turned and hissed at him to keep the noise down, but he was no longer following me. I went back, and found him lying in a fetal position on the pavement. As I whispered frantically, trying to get him to get up and run so that we could avoid capture, he just let out the pained, sickening groan that all boys come to understand at least once in their lives. “I racked myself,” he said. Tim had hit the sign pole at a dead sprint, the steel crushing him all the way down to where it filled his whole body with a guy’s cold dull paralyzing pain. After a while, I managed to get him back on his feet so that we could go back to his house, but for the rest of the night he kind of just stared off into space, not the same guy. Plot, character, stakes, voice, theme, setting . . . What aspect of the novel did you struggle most with, and how was that resolved? Which one came most easily on this book? 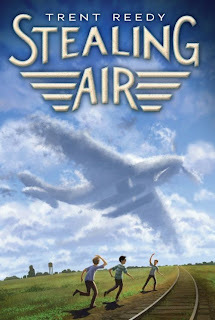 One big advantage I had with Stealing Air is that after so many years, I was very familiar with the characters and the settings, having lived in Riverside, Iowa for nine years, and small Iowa towns like it for my whole life. The biggest challenge was in determining what was at stake for the characters. My initial draft simply accepted that Brian and Alex would want to get their airplane flying simply because flying is so cool. That may be true, and it may be the way Brian, Alex, and Max would all really feel, but story reality is a bit different from real reality, and you helped me understand that for the reader to care about whether or not the boys could make their plane fly, there had to be serious consequences or rewards for success or failure. We tried several different options before centering the stakes on the Plastisteel plane being the key to saving Brian’s and Max’s parents’ company. This worked out great, because it required that I keep bringing back Mrs. Douglas, a surprise character who hadn’t appeared in earlier versions of the book. I love that character, and my only regret with Mrs. Douglas is that I couldn’t figure out how to bring her into the book even more. You and I talked a lot about what you call “the Bechard Factor” on this book. Could you describe that for me and how it played out here? I had the honor of working under the guidance of author Margaret Bechard in my final semester at the Vermont College of Fine Arts, while I revised Words in the Dust. In that novel, a character named Meena befriends the protagonist Zulaikha, teaching the girl to read and write, introducing her to classic Persian poetry. In early drafts, Meena had no name, was blind, and lived in a cave. Margaret asked me why she had to live in a cave. Why was she blind? Why did she not even have pencil and paper for Zulaikha to use in her lessons? I explained that the woman was old and her sight had just gone, that she lived in a cave because her house had been destroyed in the war. Margaret Bechard patiently explained that she wasn’t asking me what fictional circumstances within the story made the nameless blind woman live in a cave, but that she wanted to know why I had chosen to make this character be this way? What did the story gain by my making the character that way? She was asking me to consider how the story would be affected if the woman was very different. Stealing Air had been with me a lot longer than Words in the Dust. By the time I began revising it, I had been kicking around the original draft of the novel in my head for a decade. So when Cheryl asked me why Brian wants to fly this experimental plane, why Brian wanted to make friends so much, and why Brian’s family had even moved to Riverside, Iowa, I struggled to find answers. The answers had been so self evident in the story as it had been for so long that it was a challenge, once again, to step outside of the story and consider new possibilities. Stealing Air is far richer after overcoming the Bechard Factor. In the original version, Brian moves to Riverside with his mother after his father has abandoned his family. Reasoning that such abandonment would be too emotionally heavy, I changed it so that the family moved to Riverside after Brian’s father lost his job. But then the father was too depressed. Finally, when I needed another reason for Brian needing to fly the experimental plane, it was decided that Brian’s father moved to Riverside to start a company with Max’s mother. That was a breakthrough change that really brought a lot of elements together very nicely. If you could own any plane, what would it be? And what’s your favorite skateboard trick? I really admire people like Brian who can pull off amazing skateboard tricks. When I was younger, I had a cheap skateboard that I bought secondhand. I would mostly challenge myself to downhill runs where the skateboard would be zipping down a steep hill very fast. Fortunately, I lived in Iowa where the hills aren’t too extreme. There are hills and mountains where I live now in Spokane, Washington that are tricky in a car. I would never attempt them on a skateboard. There are a lot of skateboard tricks I would never attempt, but I think the people who do are kind of like superheroes. Check out Trent's website for more on Stealing Air, Words in the Dust, and his videos and media! Thanks for this interesting post! I have Words in the Dust in a stack of books on my night table, and now I'm going to move it to the top. Awesome! I love the idea of stepping outside the novel and digging deeper to make the story stronger. Very inspirational and helpful post! Thank you both. Hmm. I have one of those first novels that I've lived with for over a decade, too. It's a great plot with great characters. But it desperately needs a rewrite and it's so hard for me to wrap my mind around what needs to go and what needs to stay. Both these novels sound great and I loved your memories of messing around with your friends when you were 12-ish. Friendships are important at that age. I think kids are missing out on some of that stuff today. When you die playing video games you don't lose as much as you do when you run into a stop sign. There's something to be said for sneaking out after your parents are in bed. I enjoyed this interview, especially the "Bechard Factor's" big why question. Not only is this important for novels, but other works as well from picture books to rebuses. Great post. I love the term Berchard Factor. It's something that's new to me (picked it up in Ms. Klein's plot masterclass in Utah), and while it's cost me WAY more time than I anticipated, I'm forever grateful. Thanks for posting this and thanks to Mr. Reedy as well. Looking forward to reading STEALING AIR - it's right up my alley. Great post. Can't wait to see what you're working on next, Trent. From the comments above, I see I'm not the only one that connected with "The Bechard Factor." I still fight with the idea that just wanting something to be a certain way in my writing isn't necessarily the Best Way. Thanks for the post, Trent. Really great interview. I'm so interested in how you worked your experience in Afghanistan into your writing. I love books that have a real sense of time and place. One of my most memorable writer's retreat experiences was listening to Margaret Bechard talk about revising. She was amazingly enthusiastic about chaos - the messier the better. Sent me home ready to face my mess!